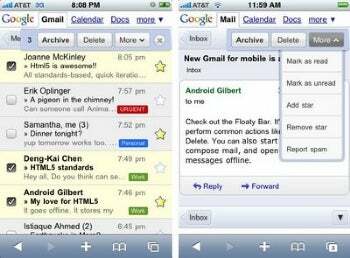 Google updated its Mobile Gmail offerings today for both the iPhone and Android-based handsets. Improvements include faster performance when opening e-mail, navigating your Gmail folders, and searching archives, according to Google's official Mobile Blog. Google has also added a feature that assures you access to your locally stored Gmail account despite a possible intermittent network connection or none at all. One chief improvement touted by Google is the ability to archive or delete multiple messages at a time. Using what Google calls a "floaty bar" that follows inside the active screen you can select multiple messages for one-click archiving or deleting. On the cosmetic front, Google has given Gmail for iPhone and Android a mini-facelift, improving the look and ease of use of the application's buttons. This, Google says, allows the mobile version of Gmail to more closely mimic what you see on your desktop. Google credits the improvements to Gmail for the iPhone and Android to new HTML5 and Gears technology that it says help it more aggressively cache data. Remarkable entry of IBM into "Cloud Comuting"